My husband has to go out of town for work most of the time. He is a sheet metal journeyman who installs HVAC in commercial buildings. We are very fortunate that he has a steady job. Unfortunately, the only work available is often out of the state. When he travels, there are often not many healthful fast food choices or restaurants available to choose from. Thankfully, however, most of the cities he visits has a Denny's! I often worry about my husband's diet when he is away. Most restaurants do not include many healthful or nutritious choices on their menus. When I found out about Denny's Fit Fare Menu, I was thrilled and made sure to tell him to visit Denny's. You see, Denny's Fit Fare Menu has a selection of healthier options and they have a huge variety of dishes to choose from. Even my very picky husband was able to select something delicious! He enjoyed the Fit Fare® Breakfast Sandwich Plate. 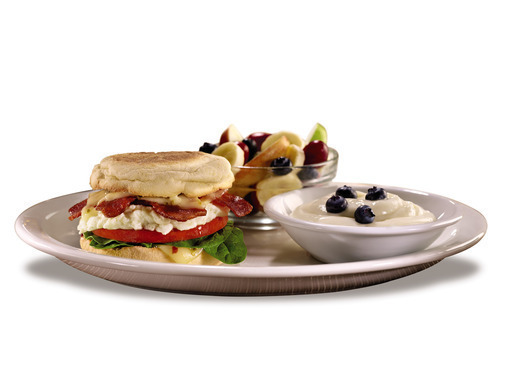 For a lighter way to start the day, the new Fit Fare® Breakfast Sandwich Plate offers guilt-free dining packed full of flavor; two strips of turkey bacon, pepper jack cheese, fresh spinach, tomato and an egg cooked to order on a toasted English muffin, served with yogurt and a side of seasonal fruit. My husband has reported that his Fit Fare Breakfast Sandwich Plate was the perfect amount of food to get him started on his long day away from home. It was delicious and satisfying as well as something he will definitely order again! I was happy that he found something at Denny's that was healthful and that he will go back and eat again. So much better than his usual breakfast of donuts and Pepsi! Disclaimer: I received a gift card to Denny's to sample their Fit Fare Menu . All opinions are my own.